Arnulf "Der Sackpfeyffer" zu Linden ("The Piper" of Linden) plays manifold music on various instruments for you. Music from the Middle Ages, in addition some tunes from Renaissance, folk music, antiquity and orient; played on historic and traditional instruments. Music from antiquity, Middle Ages, Renaissance, baroque, folk music, orient, jazz, film music, hardrock/metal, and …; partly in very unusual arrangements and with scope for progressive sounds; played on historic, traditional and modern instruments. Music played on the Great Highland Bagpipe, the worldwide known Scottish bagpipe; chiefly tunes from Scotland and Brittany, but some tunes of other origins too; or a mixed program played on four different bagpipes. 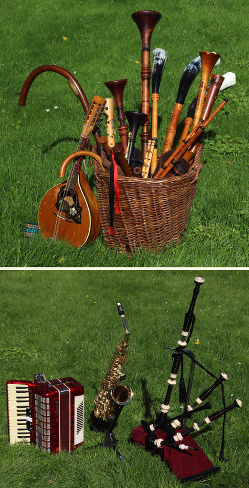 Bagpipes (Hümmelchen, Großer Bock, Schäferpfeife, Medieval Bagpipe, Great Highland Bagpipe), shawm (soprano), rauschpfeiff (soprano), zurna, crumhorns (alto, bass), sipsi, mijwiz, recorders (garklein, soprano, alto, tenor), natural fanfare, mandolin, violin, saxophone (alto), accordion, percussion and voice.